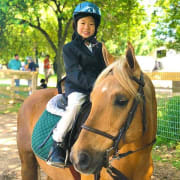 We are actively seeking volunteers to work with our staff to help care for our horses, prepare the horses for lessons, or assist instructors during lessons (by leading the horse or side walking with the rider) as well as a variety of additional barn tasks. You do not need to have any experience with horses to help out! We will provide the necessary training for you to be a growing part of our organization! We do ask that volunteers commit to a regular schedule so our riders and staff have as much consistency as possible. We will also take substitute volunteers in case someone is unable to make a scheduled time. No previous horse experience is necessary!